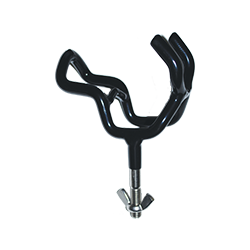 Adjustable rod holders only give you two usable positions. The Duo offers two practical rod angles with no moving parts or teeth to strip. Holds rod at 0o with handle in top rear loop, 30o with handle in bottom. Closed rear loop for extra security. Comes standard with stainless stem and wing nut.